Cars make their way through Pineville, Ky., on US Route 25E. The opioid problem in southeastern Kentucky is among the worst in the nation. 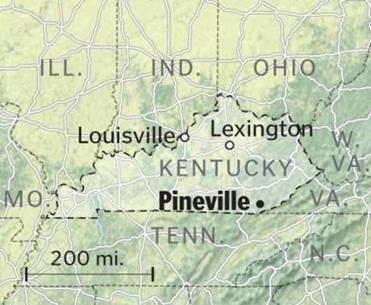 PINEVILLE, Ky. — Jay Steele has seen plenty of death in this jagged slice of Appalachia. Not only is he the county coroner, he also owns a funeral home. But even Steele can be shocked by the fallout of the opioid epidemic that has ravaged this poverty-riddled pocket of shuttered coal mines. There was the little boy in diapers, crying near the body of his great-grandfather, who had cared for the toddler because his addicted parents and grandparents could not. There were the adult children of another dead man, racing to a pharmacy to refill his painkiller prescriptions and feed their habit while the coroner’s deputy attended to the corpse. Viewed from Massachusetts, the opioid scourge here might seem like an exotic tableau from another land. But the search for solutions is something the states have in common, as is a mounting death toll from opioid overdoses: estimates of 1,087 in Kentucky and 1,256 in Massachusetts in 2014 alone. This unlikely and tragic bond has brought together US senators from the two states — politicians who cannot agree on much of anything — to seek a common solution. 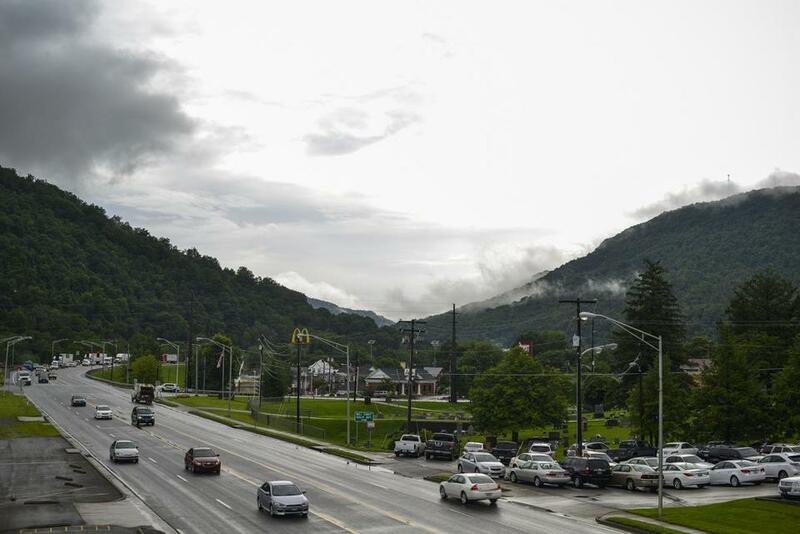 Pineville, population 1,700, is a pin-prick of a place surrounded by steep, thickly wooded hills that conjure images of Daniel Boone and other pioneers who passed through the nearby Cumberland Gap. Jay Steele, 62, Bell County coroner, has seen an uncountable number of deaths from drugs. Today, the seat of Bell County does not wear its age well. The downtown has little pedestrian traffic to divert attention from the overgrown lawns and boarded-up windows on tired, vacant buildings that need a coat of fresh paint. Nearly two-thirds of adults in the county do not have jobs, and addiction to opioid painkillers has metastasized. Miners often turned to painkillers after injuries, and many of their children became dependent on opioids stashed as close as the medicine cabinet. Nearly everyone here knows someone who has become addicted or died from opioids. The opioid death rate in 2013 was 93.2 per 100,000 people in Bell County, nearly double that of any other Kentucky county. But C. Frank Rapier, who directs a federal task force attacking the epidemic in Appalachia, said the devastation in Bell County also reflects what is happening in neighboring counties, where federal officials believe opioid deaths have been grossly underreported. The death rate in Bell County dropped in 2014, but the figure remains troublingly high. Many children are raised by grandparents, some mothers prostitute their daughters, and hospice providers lock medications in theft-proof safes at the homes of the soon-to-be deceased. “We’ve lost a whole generation of people who would have been paying taxes, and buying homes, and contributing to society,” said Nancy Hale, who leads the drug-prevention efforts in the region. Micky Hatmaker, a former state trooper and Pineville native, put much of the blame on big pharmaceutical companies for aggressively marketing painkillers, and on unscrupulous doctors and pharmacists who dispense them. “This thing took over Appalachia like a cancer,” said Hatmaker, who works on the drug task force. Pineville is minuscule, but it does have five pharmacies. Lisa Goodin fills prescriptions at one of them. She lost her brother and brother-in-law to fatal overdoses, and the job gives her a front-row view — dispiriting and unavoidable — of Pineville’s recurring, real-life tragedy. “You can see them walk across the street and sell it,” she said. Pineville police Sergeant Kyle Dunn sees the fallout nearly every time he leaves his beat-up wooden desk and heads outside. Two weeks earlier, his cousin, the son of a coal-mine superintendent, died of a drug overdose. Lisa Goodin, 42, who dispenses prescriptions at a Pineville pharmacy, lost her brother and brother-in-law to overdoses. Decades of widespread addiction pushed Kentucky to become a leader in the search for solutions. Kentucky shut down its notorious pill mills — the derisive name for for-profit businesses that dispense painkillers with scant medical oversight. In 2012, the state became the first to enact a strict mandate that physicians check a patient’s drug history before writing new prescriptions. The effect has been immediate and eye-opening. Prescriptions of oxycodone, a powerful opioid, have dropped 10.5 percent. Prescriptions for hydrocodone — also used to relieve pain — have fallen 11 percent. “These numbers always had gone up, never down,” said Van Ingram, executive director of the Kentucky Office of Drug Control Policy. The state’s campaign is being complemented by the US Attorney’s Office for Eastern Kentucky, which is aggressively targeting doctors whose practices are designed to profit from addiction. “We were really just drowning in a sea of pills,” said Kerry Harvey, the US attorney in Lexington. In recent years, his office has ratcheted up its prosecutions of “physicians who really were just drug dealers in a lab coat, and pharmacists who were just drug traffickers who happened to have a pharmacy license,” Harvey said. In June, for example, a federal judge in Kentucky handed down a 14-year prison sentence to the owner of two pain clinics, which had unlawfully dispensed hundreds of thousands of prescription pills to thousands of Kentuckians. At the grass roots, the bulk of the work is being done by Operation UNITE, a large nonprofit group that has carried a drug-prevention message to tens of thousands of students in venues from classrooms to archery camps. More than 3,700 people have received $5,000 vouchers from the group for substance-abuse treatment. And police detectives working with Operation UNITE have removed $12.3 million of drugs from the street since 2003. 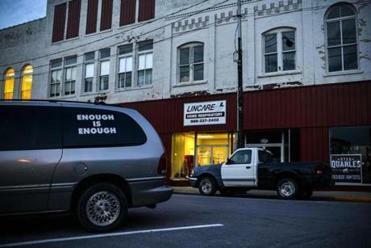 A van with the words “Enough is Enough,” the slogan of an antidrug program, was parked in downtown Pineville. The organization also sponsors an annual opioid-abuse summit that draws thousands of participants from across the country who are eager to learn from Kentucky’s experience. 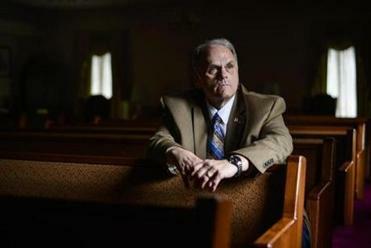 When the heroin crisis in Massachusetts took hold in sparsely populated Franklin County, John Merrigan, the register of probate, came to the summit to learn what he could. Merrigan left impressed by the collaboration among government, law enforcement, and activist agencies like Operation UNITE, but troubled by the intransigence of the opioid quagmire. “It’s scary to think that they haven’t been able to bring it under control in that region, when they’ve had such strong support,” Merrigan said. Kentucky’s pain has given it years of experience in the opioid fight. In Massachusetts, a spiraling increase in heroin overdoses seized broad public attention only in early 2014, prompting then-governor Deval Patrick to declare a public health emergency. His successor, Governor Charlie Baker, has made the opioid crisis one of his top priorities. A prescription-monitoring program for opioids was made mandatory in Massachusetts last year, and funding has been increased for addiction treatment. Massachusetts also is providing lessons for Kentucky, where officials are pushing for greater availability of naloxone, a drug used to reverse the effects of opioid overdoses. That effort is based on the pioneering success of police in Quincy, Mass., where the drug has been used to combat more than 400 overdoses since 2010. Partnerships between the states are being formed on Capitol Hill, where the ideological odd couple of Senators Edward J. Markey, a liberal Democrat from Massachusetts, and Mitch McConnell, a Republican from Kentucky, are pressing the federal government for more, aggressive action. The pair — who, McConnell said, “have absolutely nothing in common on virtually every issue you can name” — have asked for a surgeon general’s report on the crisis and detailed answers on how the Department of Health and Human Services will measure progress on opioid deaths and addiction. Estimates of overdose deaths rose 8 percent in Kentucky in 2014, compared with a staggering 34 percent in Massachusetts. Many Kentucky activists believe their message is taking root among the young. Seventeen-year-old Cheyenne Morgan is one example why. Morgan is part of an Operation UNITE summer program that preaches to school-age campers that drugs are the enemy. The program uses Americorps volunteers who, like Morgan, are working to steer the next generation from a fate that has claimed so many of their parents and older relatives. 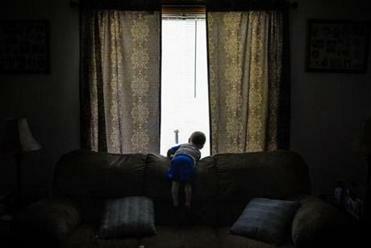 Mailakah, 1, of Middlesboro, Ky., lives with a foster family in Pineville because his parents are jailed for drug abuse. It’s a fate that Morgan knows intimately. Her mother was an opioid addict who, a decade ago, fed her appetite for painkillers while her husband served overseas in the military. In the chaos that was her home, Morgan was transformed from child to caretaker. Then, at age 10, Morgan did not have to revive her any more. Her mother died in a car crash, and Morgan — like so many children here — moved in with her grandparents. Seven years later, in these strikingly beautiful mountains that hold so much heartbreak, Morgan is helping other Kentucky children make the same promise.